Choosing the right water housing for your camera can often be overwhelming. With so many choices on the market at such a wide range of prices it can be difficult to know where to even start – after all it is a big commitment and a vital piece of equipment to protect your gear if you’re looking to evolve your water based photography skills. The good news is that you can’t go too wrong and there really is something to suit everyone and every camera. It can help to think of your options in three levels. 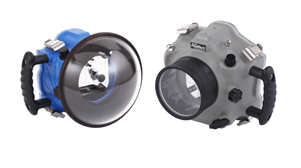 The most affordable entry point if you’re getting started is either a APS-C or entry level full frame camera with a fisheye lens, Aquatech offer a base model housing which will get you started and as you progress you can add a advanced conversion kit to the housing body. These housings start around $1500 AUD. If you are a more advanced water photographer you may want to look at any of the flagship cameras such as the Sony A7rIII or Sony A9 to take your photography to the next level, a fully functional water housing from Aquatech will set you back about $2500 which includes a port. 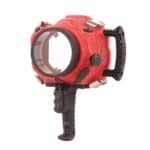 Finally, if you’re looking to dive beyond 15m natural light will become more of an issue, so you’ll need to grab yourself a dive housing with strobes. These come in all shapes and sizes and are a great addition to have in your artillery. Each housing will obviously have its pros and cons so it’s important to choose carefully – consider the depth rating and weight of the unit before committing. Once you’re ready to head into the water take the time to properly prep your water housing – this will pay off once you’re out there. Start by ensuring all your batteries are fully charged, the seals are clean, lubricated with silicon and the port is secure. Even though this last step sounds simple, I cannot stress how important it is and how often I see issues arise from frustrated students who are experiencing fog or water droplets inside their lenses as a result of not sufficiently securing things (not to mention the occasional flooding of the housing!). TIP: Once your camera is in the unit lick your port and then let it dry , this will prevent the water beading on the lens. Be careful not to touch it with your fingers as the oils you transfer result in these unwanted spots. Once you’re ready to go, getting your settings right in this action packed environment is really important. If you’ve decided to use a surface water housing to capture that fast moving surfer, wave or dolphin you will need your camera to be shooting at a speed higher than 1/1000sec. The aperture should then be set at around the f7 mark to avoid a shallow depth of field which can result from the speed of the subject. If the day is sunny and you’re using these two settings, your ISO on the water’s surface will be around 400. Now go get out there you crazy kids!